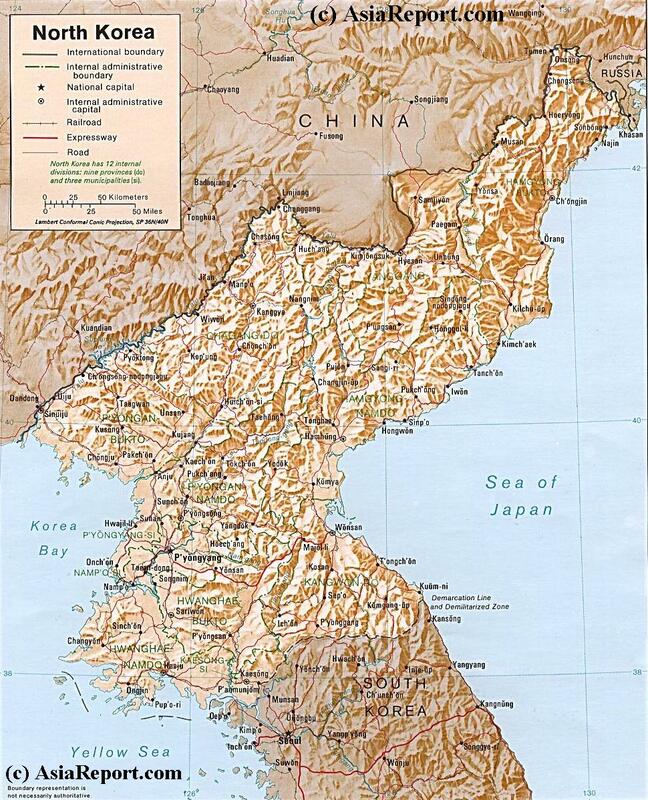 This simplified and dated geographic Map provides a complete overview of the Democratic Peoples Republic of North Korea. It dates from the year 1979. The Map provides a rough sense of the relief and terrain in this mountainous country in addition it gives the location of some of the main rivers in the Nation as well as the location of the main cities and population centers at the time. Neighboring nations and regions of Korea are in clockwise direction; Liaoning Province and Jilin Province of The Peoples Republic of China along the East and North, a Part of Russian dominated lands in current Primorsky Krai Oblast in the North-East and North, across the Sea of Japan (East Sea) the island nation of Japan in the East and South-East and finally, not depicted on this map across the Yellow Sea, Hebei Province and Shandong Province of China (PRC) in the West and North-West. Compare Maps - Follow the Links to more information on Locations ! - Click Map Image to go to Full Version ! ! 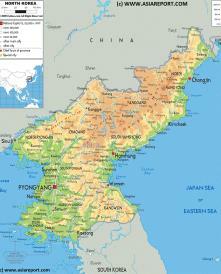 A more recent overview Map of North Korea (DPRK) created in 2009. This Map inludes Main Cities of North Korea and adjacent regions of South Korea (ROK) as well as those of the neighboring territories of Jilin Province and Liaoning of China (PRC). Link through via the map to additional information, maps and photo's on each seperate location. The Main focus of this Map is for personal travel directions. Further included are Main Roads and Highway Connections, locations of main mountains & ranges, border cities on the Chinese Border and South Korean Border, the 12 main provinces of North Korea, trajectory of Korea's DMZ (De-Milititarized Zone), locations of main historic monuments & tourist sites of the Nation & Region.